- Don't do anything that can't be a Game." I have a lot of respect for Open Road Media. Once upon a time, one of its co-founders was the CEO of HarperCollins, so it's not as if the company is unfamiliar with "traditional" publishing. But, they understand that part of the road in ahead in publishing will be through the medium of digital media. And, it is through Open Road that many authors are getting in the gate, taking a chance on first publications, or publishing their backlists and getting them back into the hands of new readers. 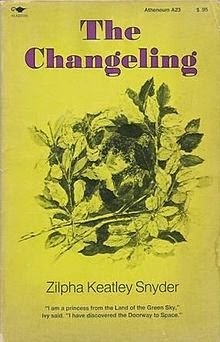 Zilpha Keatley Snyder is responsible for THE HEADLESS CUPID, THE VELVET ROOM, and THE EGYPT GAME and hordes of other interesting and unique series, and I'm excited to review her book, which was first published in 1970. It's often a strange experience to read YA lit written before I was born. I compare characters, plotline, and story arcs. I realize that a lot of what was published back then would be difficult to get published for the first time now. I'm not sure how I feel about that... or what it says about the childhood reading choices of kids who are kids now, and not in the eighties and nineties when I was much younger. I have a feeling there's entirely too much to say on that topic! However - I simply will celebrate the eclectic, varied, and unusual stories I grew up with, be glad that LIBRARIES are at the forefront of holding on to author backlists, and that this digital age is digging up some gems to put into the hands of a new generation and a new style of readership. Here's to ferreting out a few more awesome overlooked books to share. Reader Gut Reaction: I had two gut reactions, one, this book is told almost entirely in flashback. Nowadays? There's no way that an editor would be happy about three quarters of a YA book being told in flashback. Two, this book would be perfectly appropriate for young middle grade readers. Despite the fact that the beginning of the novel is when one of the main characters is a high school sophomore, the amount of time the flashback spends in grade school means that a lot would resonate. Concerning Character: Martha is shy, plump, and babyish. She is the well loved and completely misunderstood youngest child of the well-meaning Abbott family. Not a take-charge extrovert like the rest, bookish Martha lacks confidence in herself, and spends much of life in floods of tears. Ivy is underfed, large-eyed, and raggedly clothed; one of those piss-poor Carson kids, whose low class family usually has one or another members in Juvie or in jail. How she and Ivy become friends is through the magic of elementary school - and a shared love of their imaginary friends. How they remain friends through years of time, very different families, and a frowning community is something of a miracle. Together, the two make an unbeatable team. They find magic in their make-believe, and that magic fuels their world. But, sometimes, the worlds of our imagination bump up against The Real World, with painful results. Is it survivable? Yes. But, is it easy? Never. Recommended for Fans Of...: S.E. Hinton's THE OUTSIDERS, in its commentary on the individual and society, THE UNSEEN, by Zilpah Keatley Snyder, for its out-of-place-in-my-family main character, Jerry Spinelli's STARGIRL, for the quirky and unusual Ivy, THE HIGHER POWER OF LUCKY, by Susan Patron, and just about anything by Madeleine L'Engle, Cynthia Voight's early books, and Judy Blume's middle grade gems. Themes & Things: Many of ZK Snyder's books are about families - ordinary folk who have jobs, who endure school, and who navigate the usual bits of growing up through sports, games, and the long unfettered days of summer. Snyder focuses on the sometimes quirky individuals who make up those groups. Characters are either not in step with their communities, as in Martha and Ivy's case, or apt to engage in hugely imaginative games which others might not get into, like in THE EGYPT GAME, or THE WITCHES OF WORM. The novels usually also feature characters on the cusp of adulthood, and feeling the usual twinges and pains of growing - twinges which sometimes cause them to do things which are questionable or cruel - witness both witness minor character Kelly's angry obsession with Ivy, or Jessica in THE WITCHES OF WORM blaming her unkind behavior on her cat. Snyders books seem to feature a lot of inner mind and times when the character holes up and tries to figure out the world - which is how a lot of my adolescence was spent, anyway. Despite the fact that this book is pretty dated in years, the timestamp of the seventies is trimmed neatly from the text. I still think it skews younger than YA, just based on the sort of flashbacks from ages 7 - 16, it's a book that would work well as a read-aloud for younger middle graders, and a "on my own" type of read for older middle graders, and more sensitive YA readers. First, I have to say it: the watercolored cover was probably a mistake. The style seems meant to be amateurish, and while it does hark back to the book, where the girls were one day painted by a woman whose name was Mrs. Smith, it is neither exactly the painting that Mrs. Smith did, nor an accurate representation of the girls - something I'm a stickler for. It was a lovely image that probably... shouldn't have been attempted. 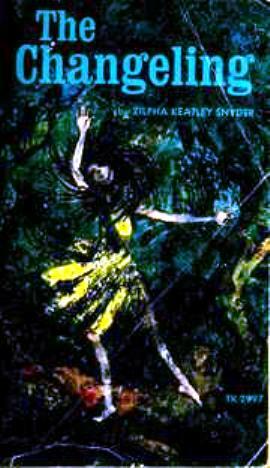 The dark cover with the title in blue, and Ivy dancing before the tree in her yellow dress once ties back to the story, but sometimes the depiction of someone who is supposed to be different or look counterculture can be too specific, and feed the imagination where it would better be to allow a picture to develop all its own. Ivy never looked nutty with her dancing to my mind - just free. Here, she looks like she's been caught up in a tornado that might leave her in Oz. I love the Dell cover. Just. Love. It. It's solely for the purposes of familiarity, but these were the covers of my childhood, with those photo-realistic drawings that always went along with some happening in the book. I also really like the most modern cover, which is the first one depicted. The girls in the woods - themselves in silhouette, but their clasped hands, telling the story of a friendship that through distance and misunderstandings, survived. 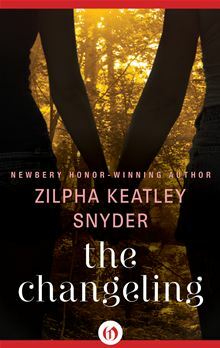 You can find THE CHANGELING by Zilpha Keatley Snyder at your local library, or at an independent e-retailer, and possibly even in some pretty special brick-and-mortar indie bookstores near you! Oh, Tanita, this is one of my favorite books of all time. I don't know that I could discuss it objectively, because (I'm showing my age here), I first read it when I was probably 10 or 11. But I always found it magical. I LOVE that never grow up poem. I actually think of it fairly often ;-) I would put this one as middle grade, not YA. Even as a teen, Martha isn't very mature by today's standards. AHA! I knew there was something I'd forgotten - I have now added the link to your 2007 Under Radar review! I remembered that and smiled when I saw this book reissued. I'm glad to have brought you happy memories. I loved ZKS but never read this one--though I read almost everything else of hers. Back then, YA did skew younger, and it was more sanitized. A lot of what was considered YA then would probably be MG now, ZKS's work included. YA and MG also used to be shorter. Frex, SE Hinton's The Outsiders was a typical length for the time, though now it would be on the short end of publishable, and MG books were proportionally shorter also. And this fascinates me: was it just the effect of the long Harry Potter books on the market? We keep talking about how people have less time and attention for reading, yet our books have gotten longer. I went through a huge ZKS stage when I was in 6th or 7th grade! I was reading a lot of Diana Wynne Jones then, too, so I kind of link the two in my mind. 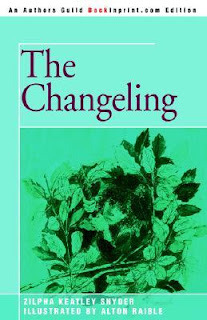 That Dell Yearling cover is definitely the one I remember. Length is an interesting question--I've been thinking about it a bit because my publisher definitely seems to have a max length (at least when it comes to my books!!). I do wonder whether it's a side effect of the HP books. After all, it doesn't seem to be standalones that have gotten longer--it seems to be the series books. Actually the cover of the 2004 BookImprint edition you have there was not from the 1980s. 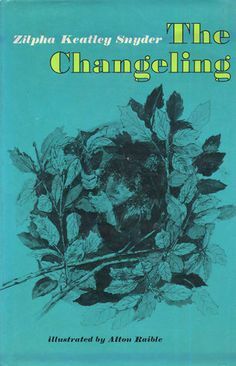 It was adapted (aquamarine color and all) from the original cover from the 1970 first edition. Here's the original Atheneum paperback -- more of a spring green color. The illustration is by Alton Raible (still alive), who did nearly all of Zilpha Keatley Snyder's books. The Changeling was out of print before 1980. The watercolor cover and the Dell Yearling cover you liked are from late-1980s reprints. Raible also did the "tornado" cover which is, as far as I can make out, the 1970 SBS paperback edition. I agree that the watercolor cover is terrible. 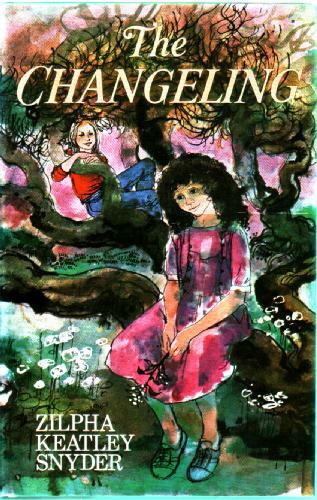 It doesn't give you an accurate idea of who Ivy was the way the Yearling cover and Raible's "face in the leaves" cover do. I love Zilpha Snyder's books, especially the early ones. She is one of very few authors to actually depict the world of sustained fantasy games. I had one a lot like Ivy's (still do, it's more of a detailed daydream now), don't let anyone tell you boys don't play games like that. I took “drawing lessons” from Raible's illustrations for years. Did you catch the race hatred behind the ostracism of the Carsons? Their mother's name was Montoya; they were Hispanic. Another blogger has speculated Ivy was part Asian on her dad's side. Well, it was northern California, that's entirely plausible! I'll link to my page on Barbara Follett, a real "Changeling". @Bluejay Young: Thanks for the correction - and for the heads up about your page!